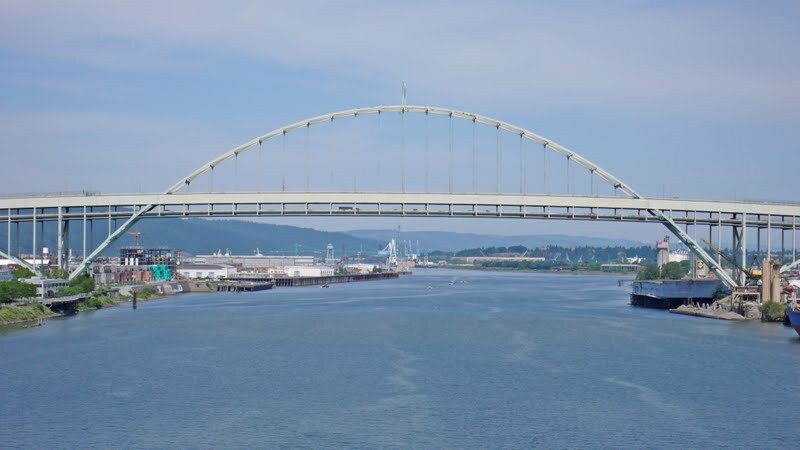 The Fremont Bridge carries US-30 and I-405 traffic over the Williamette River in downtown Portland, Oregon. It was named after the military officer, explorer, and presidential candidate John Charles Fremont. The bridge looks like a through arch but it is actually a tied arch, with the 902 ft (275 m) center section fabricated in California, assembled at Swan Island, floated to the bridge site, and lifted 175 ft (53 m) into place. It is a double-deck bridge with four lanes of traffic in each direction. A commission was invited to participate in the design, which greatly increased it's cost (to $82 million). The bridge was opened to the public in 1973. At that time, it was the world's longest tied arch bridge ever built and the largest weight (at 6000 US tons) ever lifted. A tied arch bridge is sometimes called a bowstring arch because the arch is like a bent bow with bowstring (the deck and girders) under tension. These high stresses make this type of bridge susceptible to maintenance problems due to fatigue at the connections. Arch Bridges: Fremont Bridge by Mark Yashinsky is licensed under a Creative Commons Attribution 3.0 United States License.